Here at Home to Indy, Fall is one of our favorite times of the year. The weather is cooler, the leaves are changing, and Halloween is right around the corner. In the spirit of this spooky holiday, we thought we'd share some easy DIY Halloween crafts for you and your family to help decorate your new home! Not only will it be a fun activity for you, it will add some spook-tacular decorations for your Trick or Treaters. Note: We know we're posting this early, but we wanted to give you time to make these boo-tiful masterpieces. Ghosts are a must when it comes to Halloween decorating, and these happen to be really easy to make. 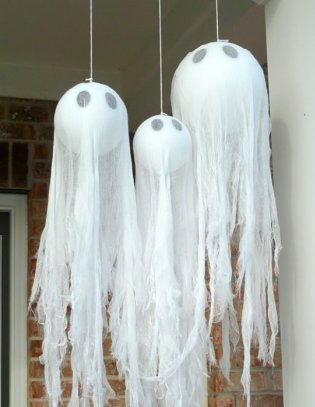 With a few Styrofoam balls, some cheesecloth and a black marker, you can create tons of these spooks to hang all over your porch (or inside if you prefer). Shredding the cheesecloth at the bottom gives your ghosts a very really eerie look. No table is complete for Halloween without a centerpiece - or these sweet-looking decor would also look great on your front porch steps. These are super easy to make and look great once completed. 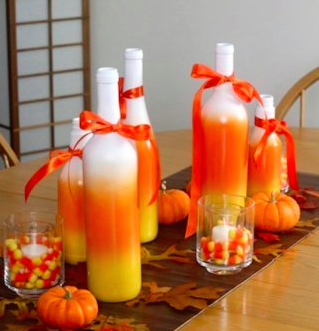 Simply spray paint the candy corn colors onto old glass bottles, then add some ribbon. This is a great project that you can keep from year to year. You can make one bottle - or several - to create a beautiful display. Don’t forget to add a little real candy corn as well! So, pumpkins have to be part of your Halloween décor, right? Instead of carving them (which is also fun), you can decorate them in other ways. This lets you have really great décor for the holiday, and it won't "wilt" like carved pumpkins tend to over time. 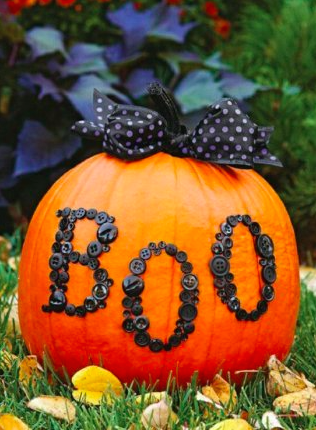 Decorate your Halloween pumpkins with ribbon, buttons, markers or whatever you have on hand. You can be as creative (or scary) as you like. Tin can luminaries are a great way to add a bit of Halloween to without spending a lot of money. (If you already have the cans on hand, you likely won’t have to spend a penny.) 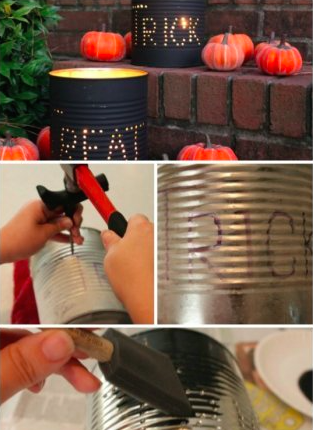 Rip off your tin can labels and poke holes in them with a hammer and a nail spelling out Halloween phrases (like "Trick" or "Boo"). Paint them dark colors for an added effect after you add candles to the bottom of them. These are great for lining your drive, sitting on your porch, or hanging. 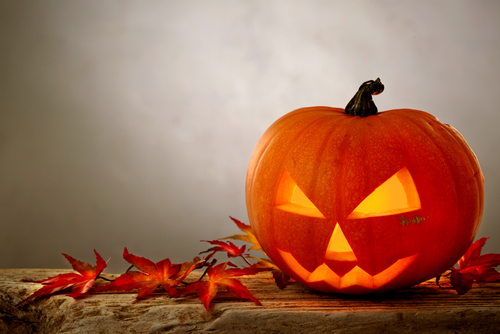 Here's to a happy, safe, and boo-tifully decorated Halloween! Do you have other easy DIY Halloween crafts you like to make? Share your ideas in the comments below!